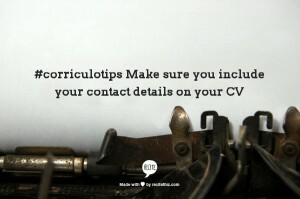 Which silly CV mistakes are costing you interviews? No or incorrect contact details – it’s a no brainer. If we cannot call or email you, we cannot talk to you about the job in the first place. Spelling errors and typos – the vast majority of CVs will have a typo in it. My personal favourite is “I demonstrate good attenton to detail” (sic) I am terrible at proof reading (although I did come across this advice to help http://bit.ly/1E5bEuy). It is essential that you get someone else to read your CV, and then get another person to read it as well. If there is a mistake in the first paragraph of your CV, the hiring manager will be looking for further mistakes throughout the CV, if they even bother to read on. Photos – In some parts of the world it is common practice to include your photo but in the UK it is something that is likely to do more harm than good. Make sure you include your LinkedIn URL on your CV so people can see what you look like if they really want to. Inconsistencies – Stick to the same font and formatting throughout your CV. Ensure you include the company name, job title and dates in the same order. If you have used bullet points, use them throughout and make sure you use the same kind. You get the idea. Unexplained career gaps – People tend to jump to conclusions if you don’t tell them what you were doing. A few weeks here or there is fine but anything longer means they’ll have to question it. This slows the process down and potentially opens them up to discrimination claims so it tends to be left well alone. If you are struggling with this bit then talk to your recruiter – they can advise you. Overly long CVs – About 2 to 4 is right. Any less than this, unless you are a recent grad, and you’re probably leaving out vital information. Any more than this and it just won’t be read. If you have a lot of technical skills, for example, try listing them rather than bullet pointing them. Try reducing the word count and leave out irrelevant information. It’s lovely that your cat is called Ginger, but it won’t help you get a job. And the biggest one – a CV that doesn’t actually tell them why you can do the job and that you have the skills to do it. There can be high volumes of applications per role. Recruiters and hiring manager only have your CV to rely on to know if they should call you – if you don’t spell it out for them, they’ll never know how good you are. If you’re not sure how to start writing your CV, why not check out our twitter feed, LinkedIn page or our G+ community for lots of advice.